Farmer Angus is a flurry of quick talk and rapid movements, as if he doesn’t have enough hours in the day to get everything done. But then, he’s got a lot to do, from producing top-end wine to saving the planet. On his shed wall are blown-up photos of the industrial food system, which form one large poster of animal misery. Cows standing packed in feed lots. Chickens stacked on top of each other in boxes. Pigs on their side in tiny cages, unable to move. Farmer Angus gestures at the wall and says food produced this way is more expensive than it looks. He speaks with the authority of someone who’s worked in finance, although he’s now a long way from life as a broker at Goldman Sachs in London. “There’s no interest in true cost accounting,” he says. “If it existed, then the beef from there would be multiples more expensive than grass-fed beef. Because of all the health damage to a human being from eating too much Omega 6 that’s not in the cost.” Or the health damage caused to workers who breathe in faecal dust, or the “environmental damage that’s not in the price”. It’s a sunny spring day in Stellenbosch, and in between unleashing a tirade against industrial farming, taking eggs from the cartons on the bench to hand to people who wander in, and juggling a phone that never stops ringing, Angus McIntosh is a ball of energy. A nearby glass cabinet is stacked with copies of Michael Pollan’s bestseller The Omnivore’s Dilemma. “That’s the book that got me farming,” says McIntosh. In 2004 he came to Spier with his wife Mariota Enthoven, whose family own the property, and they got stuck into the restoration of the property. Pollan’s 2006 book looked at the American food chain from field to supermarket, excoriating industrial agriculture. The hero of the book, Joel Salatin – on whom Farmer Angus models himself – is a ‘polyculture’ farmer, who puts multiple crops and animals in the same space, so that each species aids the others. Although polyculture isn’t a biodynamic method, it fits perfectly with the biodynamic belief that the farm should be a self-sustaining system – a philosophy that McIntosh has fully embraced. And part of his farming project began with ripping up vineyards. Spier has been a wine farm since 1692, with one of the oldest wine cellars in the country, dating back to 1767. Nevertheless, it wasn’t until 1971 that the first wine was bottled under the Spier name. 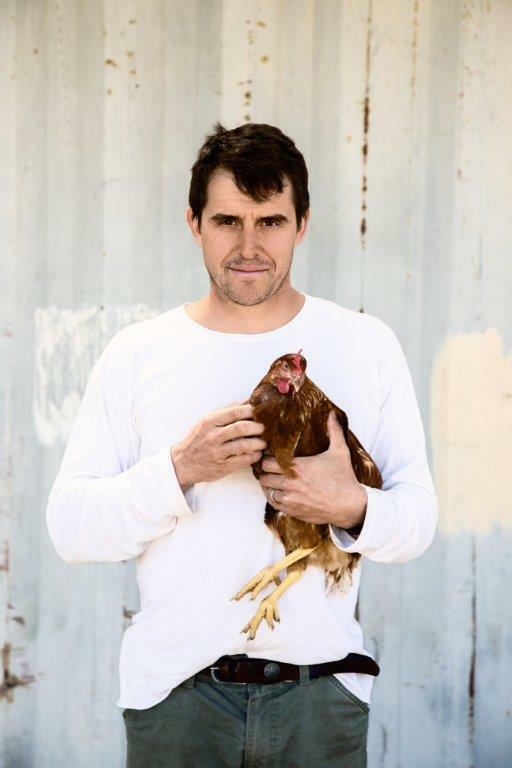 Entrepreneur Richard Enthoven – insurance magnate and owner of Nando’s chicken chain – bought the 656 ha property in 1993 and set out to restore it. Today’s Spier Wine Farm is a destination, with a hotel, a restaurant, a convention centre, a craft market, and a farm complete with vineyards, plus another 100 ha of vineyards in the Paarl region. But that doesn’t begin to describe what Spier is all about. It’s also a rehabilitation centre, dedicated to resuscitating the environment, improving the lives of its people and helping South Africa’s arts and food scene flourish. There’s a profit-sharing olive oil business, a tree planting scheme and certifications in all directions. Although the tasting room looks glamorous, every single table, beam and piece of chandelier is either second hand or recycled, with textiles made by local craftspeople. There are stark reasons for all this effort. South Africa has a high unemployment rate, at more than 26%. The country also faces major environmental challenges, including a recent drought that was so severe, staff at Kruger National Park considered a cull of the hippopotamuses. If South Africa can’t offers its citizens health care, literacy and employment – not to mention housing and clean water – then it faces a bleak future. That puts a huge burden of responsibility on businesses like Spier, who need South Africa to flourish for the sake of their own future. Smit says that if the grapes are properly balanced in the vineyard, they don’t need a lot of sulphur in the winery. “The other thing is that when you go sustainable, your yields drop dramatically for the first couple of years,” he says. The big issue is water. “The soils are getting dryer and dryer,” says Smit. Although Spier has a very low water usage – it takes around 1.3 L of water to produce a bottle of wine, from vineyard to bottling – they still need to use supplemental irrigation. The challenge for the future will be finding the right vines and rootstocks to deal with the impact of climate change. “Our climate will force our decisions,” says Smit. That the soil is the basis of all life was a key insight of the biodynamic movement, and whatever people think of the stranger aspects of the philosophy, on this point they have the full weight of science behind them. Generating just 3 cm of topsoil takes 1,000 years, and the UN has said that if soils continue to degrade at their current rate, the world’s topsoil will be gone in less than 60 years. The cause of that destruction is erosion, global warming, deforestation — and chemical-intensive farming. 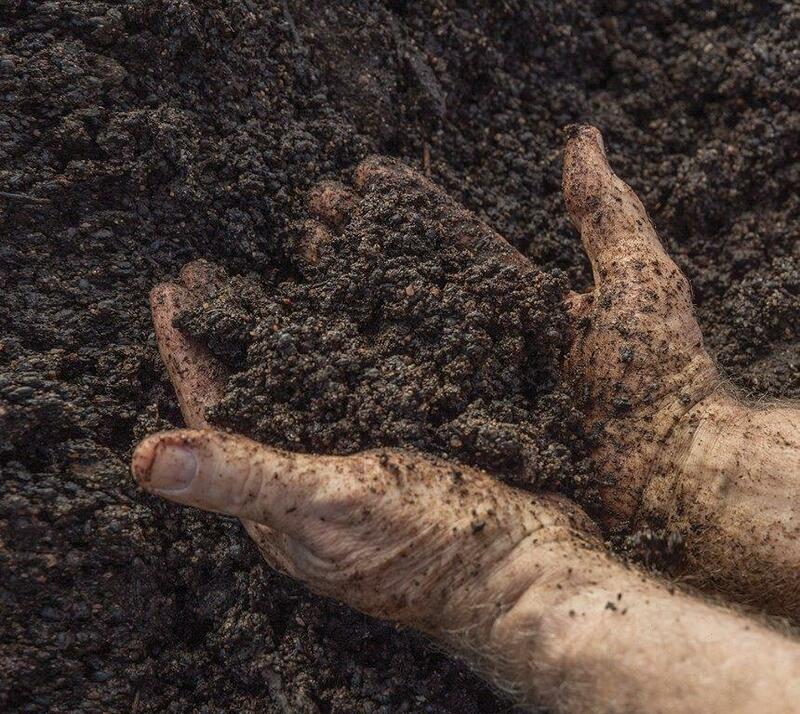 Biodynamic farmers are committed to rebuilding soil health, particularly through the application of compost. Animals can play a huge role in this project, because their dung not only fertilizes, but it also spreads seeds. McIntosh gets into the back of his white four-wheel drive, which is being driven by Jell. She’s wryly humorous and able to navigate dusty corners with aplomb, even when tourists on Segways whizz out from nowhere. She steers expertly to a field near a herd of patient Limousin cattle, and McIntosh exits the car. “I also butcher my own meat,” says McIntosh in full hearing of the cows. There had been a Chardonnay vineyard nearby. When McIntosh took over management of the farm in 2004, there were 55 ha of grapes. “I sat down with Frans and for a whole season we tasted everything and then we said, ‘Listen, this is horrible crap’,” says McIntosh. The vineyards were grubbed up, until there were only 21 ha left. “The wines have got better every year,” he says. And there are multiple major awards to prove it. Eventually there will also be ducks, to cull the snails. And to provide variation on the menu. This farm possibly represents both the past and the future of wine. In the old days, many winemakers owned mixed farms, with multiple crops. But in an age of fertilisers and high yields, growing small amounts of anything wasn’t viable, and mono-cultures – including mono-culture vineyards – became the norm. Today, as viticulturists stare down the threat of drought, climate change and pestilence, mixed farming may need to return. The tour over, McIntosh jumps out of the car and back into the shed. There are so many more projects he needs to be getting on with. A report from the 2008 Climate Change and Wine conference in Barcelona, Spain.